One of the largest global E Ink e-readers manufacturers PocketBook takes part at the 17th International Vilnius Book Fair, which will be held from the 25th till 28th of February 2016 to show its high-end products and share with the wide audience the latest information about its new developments and projects. At Vilnius Book Fair PocketBook will share the exhibiting area with its key retail-partner in Lithuania — TopoCentras. The history of partnership now counts more than three years and is resulted in thousands of E Ink e-readers sold, which are providing excellent reading experience to the users in PAN-Baltic region. The guests of Vilnius Book Fair will have a chance to see premium E Ink e-readers, among which — the company’s flagship model PocketBook Touch Lux 3. Equipped with E Ink Carta™ HD display and LED frontlight, performed in stylish and ergonomic design, the e-reader has become the bestseller in Central and Western Europe. PocketBook Touch Lux 3 is the successor of PocketBook Touch Lux 2 — the bestseller with its wide functionality and excellent design concept rewarded by Red Dot Design Award 2014. Another e-reader to be shown at Vilnius Book Fair — PocketBook Sense. The hi-end device has a light sensor, which reacts to the slightest changes in lighting conditions and provides uncompromising reading comfort. The visitors will also have chance to see and test two other key PocketBook products, such as 8-inch diagonal e-reader PocketBook InkPad with maximum screen resolution in its class, and PocketBook Ultra — which became popular due to its unique feature of ISBN recognition and text-scanning function. • Effective business planning and targeted promotions using reading statistics and history from customized e-readers. «We are honored to represent to book lovers in Vilnius our premium E Ink e-readers, which serve the only aim — to provide excellent e-reading experience. The E Ink screens use only reflected light and are completely safety for eyes. They also don’t glow at the sun and gives perfect opportunity to read comfortable even outside. 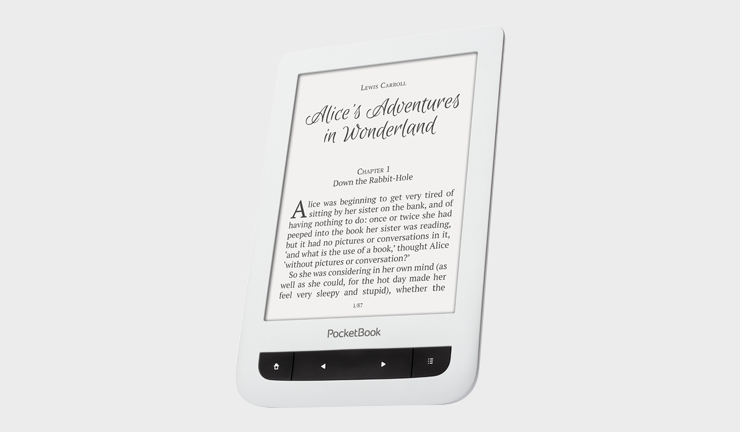 E Ink e-readers make it possible to keep an entire library in your pocket. An internal memory of an average e-reader is enough to store about 2000 e-books. The frontlight function allows to read at any lightning conditions. Moreover, PocketBook devices allow to read up to 22 book formats without converting. We are glad to provide maximum freedom of reading to book lovers in Lithuania. We are also glad to represent the comprehensive software solution for our potential partners. The new projection called Digital. We have combined our experienced services from around the World to meet the important requirements of the e-book market locally. Proudly, we announce the solution, which will allow us to bring even more possibilities for comfortable e-reading together with our partners», — comments Maksym Zheleznyak, Head of Sales in CEE region. Visit PocketBook at the 17th International Vilnius Book Fair (booth D14, hall 5)! Dive into the world of comfortable e-reading!